See our instructional videos to find out more about Single and Dual Channel Analyzer Mounting. See our equipment VIDEO SCA and DCA Overview. 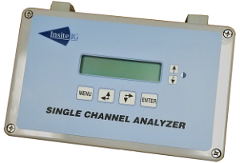 The InsiteIG SCA is a unique analyzer that will accept any standard InsiteIG dissolved oxygen (DO), suspended solids (SS), pH, or ORP sensor. The SCA will automatically configure the sensor for correct operation. The SCA has an alpha-numeric LCD display that is backlit and UV protected. The first line displays the type, reading, and units of the sensor. The second line displays the temperature for DO, pH, and ORP sensors. The SCA will automatically recognize the sensor type (DO, SS, pH, or ORP) and configure itself for proper operation. The DO sensor will come factory calibrated and ready for use. The SS sensor is zeroed at the factory, and comes with a default calibration curve. The pH electrode is factory calibrated with its holder, and the ORP electrode is matched with its holder. To utilize factory calibrations for SS and pH, sensors must be connected to the analyzer indicated per the "Factory Sensor Configuration" label located on the analyzer. The Optical DO sensor does not need sensor caps, membranes, fill solutions, nor routine calibrations and maintenance. The SS sensor is based on near infrared technology, which eliminates inaccuracies caused by changes in the process color or changes in particle size. The pH sensor is flat glass / double reference junction temperature compensated construction with embedded electronics for reliable digital communications. The ORP sensor is flat surface platinum / double reference junction construction with embedded electronics for reliable digital communications.